I love interior design and all things houses. It has been my great privilege to create spaces over the last fifteen years for a varied and loyal clientele. The collaborative nature of projects with clients is my favorite part. I like spaces that I design to read like a biography of the clients needs, experiences and travels. I consider it sport to have every detail of the room give a perspective on the client. Charmean Neithart Interiors is a full-service, high-end residential design office with a full-time staff and ten years of experience. We are based in South Pasadena, CA and have projects throughout Southern California. Erika Bruder is the principal of EB Interior Design, an established Full Service, and Award Winning Design Firm. She has been practicing Interior Design since graduating in Interior Architecture and Interior Design from UCLA. Erika’s experience and expertise applies to all types of projects in both residential and commercial. Erika has a passion for providing outstanding customer service to her clients. She has grown a network of collaborating professionals formed through years of practice, which includes architects, builders and artisans who share her vision. She specializes in Kitchen and Bath Design. She contributes this expertise at the National Kitchen and Bath Association Board where she serves as a Chapter Officer. She has also participated in the 2008 Pasadena Showcase House of Design and participated in Color Forecast Focus Groups. She is continually enhancing her knowledge by attending workshops and lectures to remain a frontrunner with emerging trends while respecting the environment. Her outlook is formed by a respect for historical architecture combined with an appreciation of modern design. Her interiors are typically clean and uncluttered; she is comfortable working in a variety of styles. Our contemporary homes tend to be warmer and our traditional homes are streamlined and clean. Erika's takes a sincere and personable approach to having an understanding of what will make her clients home personalized, comfortable, and fulfill one's dreams. Susan Sawasy works closely with her Clients to understand their expectations as they relate to their project's design, budget, and deadlines. She works hard to merge her style with the Client's. She brings a wealth of sources and talent to all of her work. Her ability to edit the sometimes overwhelming options allows her Clients to make decisions with confidence. In the end the space should reflect the owner’s lifestyle, but should relate well to itself as a whole. Rooms should speak to each other, the colors, textures and furnishings should be well integrated. We're a home staging company that strives to transform your ideas into stylish, warm, and inviting spaces. Our goal is maximize your home's potential, to sell for the best price in the least time possible, by creating the indoor-outdoor space of your dreams. Our eclectic collection of vintage and modern furnishings and art allows us to bring each project to life and realize its true potential. Watch Me Help Mila Kunis Surprise Her Parents With a Condo Makeover! 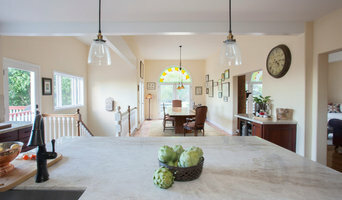 <a rel="nofollow" target="_blank" href="https://www.houzz.com/ideabooks/82192712/video/my-houzz-mila-kunis-surprises-her-parents-with-a-condo-makeover">https://www.houzz.com/ideabooks/82192712/video/my-houzz-mila-kunis-surprises-her-parents-with-a-condo-makeover</a> BGDB Interior Design (dba Breeze Giannasio Interiors) epitomizes fresh, sophisticated, timeless design. Classic interiors for the modern eye is our abiding pricipal. BGDB was founded by Breeze Giannasio, a former corporate lawyer who redirected her career to embrace her passion for design. She brings the exacting discipline and rigorous standards from her former career to bear in managing the design process, paying attention to every detail and customizing each project to explore and reflect her client's needs. Comfort, livability and function ground every design - from there we aim to elevate our clients' expectations as to what it means to live well. Breeze started her design career at Hickok Cole Architects where she focused on hospitality-inspired multi-family housing projects. Through BGDB Interior Design she has enjoyed a range of work, from sophisticated urban residences to casual seaside retreats. Common to each project is an allegiance to bring out the client's personality in each room. That pursuit inevitably involves an artful integration of architectural elements, a refined color palette, bold silhouettes, a strong sense of scale and proportion, and unerring attention to every detail. Breeze's work has been featured in House & Home, Maison & Demeure, Domino, DC Modern Luxury, The Washingtonian, The Washington Post, Apartment Therapy, Design Sponge and many other design/shelter blogs. Feel free to reach out to us, we would love to hear from you! An avid outdoor enthusiast, Sheri draws her inspiration from the beauty of the surrounding Southern California landscape—the beach, the mountains, the desert. “My design philosophy is rooted in simplicity – clean, uncomplicated lines,” she says. She also favors a neutral or classic color palette—another nod to nature—using punches of color with paint, textured accessories, and art for a touch of drama. Sheri works closely with her clients, fully understanding their needs, style preferences, and budget constraints. With this input, she creates an environments that is comfortable and enduring, one that will last through changing design trends. “Life gets complicated. It has always been my goal to create a serene, peaceful home for each of my clients.” Sheri Molder(ASID) has been practicing residential and commercial interior design for more than 30 years. A Southern California native, Sheri received her Interior Design degree from the prestigious Cal Poly San Luis Obispo College of Art and Design. As a professional member of the American Society of Interior Designers (ASID), where she currently holds a board position, and a Certified Interior Designer in the State of California, Sheri has been a participating designer in the Pasadena Showcase House, The Bennett Idea House, and in the Descanso Gardens Hospitality House Christmas Showcase. She also has had client homes included in the Pasadena ASID Showcase of Kitchens. Her interior designs have been featured in national publications such as Home Gym and Fitness, Family Circle, Designers West, Glendale Magazine, and Better Homes and Gardens. Her projects range from small scale accessorizing to planning and executing large scale remodels. Each member of the team at Designs of the Interior has been involved in design for decades, and came together when Designs of the Interior formed in 1997. Since then, we’ve become known as the design team that can portray beauty, warmth and comfort in each and every space, and reflect each client’s lifestyle and personality. We never underestimate the power of brainstorming to bring each project to its highest level, and still include principles of practicality, functionality, problem solving and adherence to budget. Remarkable resources within Designs of the Interior enable us to create any design style or an eclectic blend of several. Remodel projects allow Designs of the Interior to show its best self, with consultations for material selections or renovation guidance that serve as the perfect backdrop to complete interior and exterior transformations. Each client is important, and we strive to create clients for life, who love to refer us to their friends, family and neighbors.